Using the latest rotary cleaning equipment we clean your roof of dirt and moss faster, and with less mess than ever before. 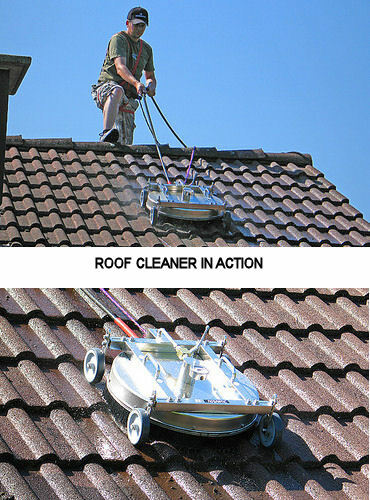 Roof cleaning done properly, from the safety of the roof ridge with properly angled and controlled jets, and all under a protective cover, so your roof gets cleaned without blasting it all over your property (or your neighbours!). Roof cleaning just doesn’t get any better. Recommended after cleaning is the application of a protective coat of sealer, this can be a coloured sealer or a clear sealer (clear is best where the tiles are self coloured) but have a look at our roof coating pages for more info on this. 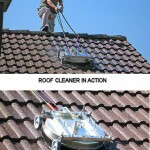 Yes, roof cleaning is more expensive than drive or general pressure cleaning activities, no doubt about it, more safety equipment and precautions are needed, more pre-wash preparation required, and more time to clean up afterwards, gutter down pipes may need removed in order to protect your drains from blockages, and then obviously replaced and washed out after the cleaning process is finished, but with prices starting from as little £350 it doesn’t need to break the bank! The roof cleaning process removes all dirt, algae and moss, and makes a very good job of this, keeping regrowth at bay for several years at least, under normal circumstances, but unfortunately spores can continue to exist deep within the roof material, which means that the moss you just had removed can start to regrow within a couple of years! And while the reality is that it can take many years to return to the same level it was before the cleaning, we recommend a treatment is applied to the roof which kills these spores completely, meaning they take much longer to gain a foothold again, and while nothing (not pressure washing, resins, biocides or treatments) can stop it forever, it does greatly increase the time before it returns. It’s not hugely expensive either (is biodegradable, and contains no bleach, acid or caustics), and when applied after a professional high pressure clean, it can greatly increase the time it takes for regrowth to occur. So if you are concerned about your roof, whether it is just the cosmetic appearance or you have serious moss issues, give us a call for a free, no obligation, and no hassle quote for our roof cleaning service, you might be surprised.